It's happening, it's finally happening. The mother of all winter transfer deals took a step closer on Wednesday with the arrival of Gonzalo Higuain to take a medical with Chelsea ahead of a loan move from Juventus. Of course, the results of that medical for a footballer not known for his peak physical fitness are by no means set in stone. But if it all goes through and Higuain comes out of the process in semi-decent shape, the Argentinean big chance-choker could start getting Chelsea knocked out of contention for tournaments as early as Thursday with a second-leg, semifinal League Cup clash against Tottenham. In the kind of beautiful timing not shown by Higuain this season - just six league goals scored - Genoa striker Krzysztof Piatek arrived in Milan for a medical to replace the now departed Higuain. This should then trigger the final part of the move which would see Alvaro Morata moving on loan to an Atletico Madrid side that is actually getting on fine in La Liga with just one defeat this season, but definitely needs more support up front for Antoine Griezmann, who has been carrying the Rojiblancos in the goals department. 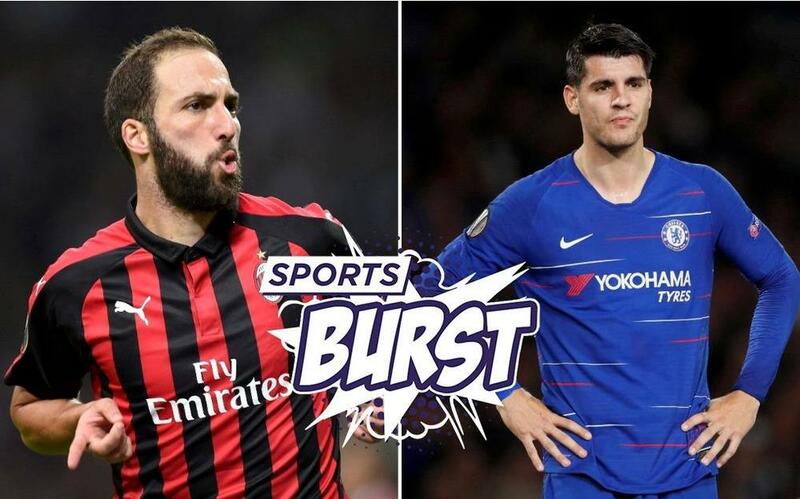 The Sports Burst live show will look over which club will come out winners in that winter window mega move. Just head to our beIN SPORTS USA Facebook page at 12PM ET / 9AM PT for all the fun. The search is continuing in the English Channel for missing footballer, Emiliano Sala. The Argentinean was one of two people traveling to Cardiff, Wales from Nantes, France in a private plane which went missing on Monday night. An extensive search began on Tuesday and will continue on Wednesday but hopes are low on finding the 28-year-old footballer alive. The player had just completed a dream move to Premier League side, Cardiff City, and was traveling there having said a final farewell to teammates in France. Current Fulham boss, Claudio Ranieri, coached Sala while the pair were together at Nantes and praised the Argentinean for being a "fighter" and a "wonderful character." Monaco manager, Thierry Henry, spoke of the "devastating news" on social media while Kylian Mbappe posted a photo of the two players together during a game. A Coupe de France match scheduled for Nantes on Wednesday was postponed due to the distressing news for Sala's former teammates. The Copa del Rey continues on Wednesday with a truly classic encounter between Sevilla and Barcelona. The first leg is in the Sanchez Pizjuan and there is set to be gold in them, there hills between these two teams. Lionel Messi has been left out of the squad, but there is a spot for new signing, Kevin-Prince Boateng, who will need to get off to a flyer to quieten critics who suggested that the forward is not quite at the level to replace Luis Suarez on quiet days. That game is live on beIN SPORTS at 3:25PM ET / 12:25PM PT. The Copa Libertadores qualifiers continue today – beIN SPORTS is the new home donchta know! – with Deportivo La Guaira (Venezuela) taking on Real Garcilaso at 6:25PM ET / 3:25PM PT. PSG takes to the field in the Coupe de France against Strasbourg in a game live on beIN SPORTS CONNECT at 2:50PM ET / 11:50AM PT. Monaco’s season took another nose dive on Tuesday with elimination by Metz. And it’s all to play for in the English League Cup with Burton Albion looking to turn over a 9-0 deficit from the first leg, semifinal encounter with Manchester City. At least Albion has home advantage. Serena Williams was knocked out in Wednesday’s play on the other side of the planet at the Australian Open. The US legend was 5-1 in the final, clinching set but collapsed against her opponent, Karolina Pliskova. “I just think she was just nailing and hitting shots,” admitted Serena, refusing to blame an ankle injury picked up just before her downfall began. Kvitova will face another American challenger in the semifinals in the form of Danielle Collins. The second pairing has Karen Pliskova taking on Naomi Osaka. The men’s semifinals pit French player, Lucas Pouille, up against Novak Djokovic with the other clash sees 17-time major winner Rafael Nadal against Greece's bag-of-fun Stefanos Tsitsipas. Next Sports Burst - Another Nightmare For Neymar?